Blue Star Direct have been awarded in the 2014 NAB Supplier Awards as winner of the “Innovation” category. 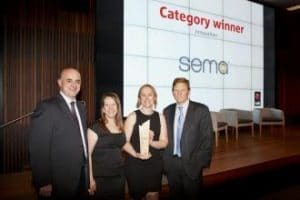 The awards program has been in place since 2010 and past winners include Clemenger BBDO Melbourne and RP Data. The purpose of the awards program is to foster relationships that go beyond the traditional supply and demand relationship. This philosophy is one with which Blue Star Direct are closely aligned. The Blue Star Direct / NAB relationship began over 12 years ago with Blue Star Direct delivering all of NAB’s direct mail marketing communications. More recently, Blue Star Direct have worked closely with NAB to deliver more communications via digital channels and establish a robust digital marketing platform across the NAB Group which includes UBank, MLC and JBWere. It is this work in the digital space that has seen Blue Star Direct recognised as the top supplier in the “Innovation” category. Rachel Baldovino, General Manager Sales and Delivery – VIC and Rita Karagiannis, Client Business Manager attended the award ceremony in Melbourne and were very proud to take home the accolade.